Stuffing boxes are ubiquitous. 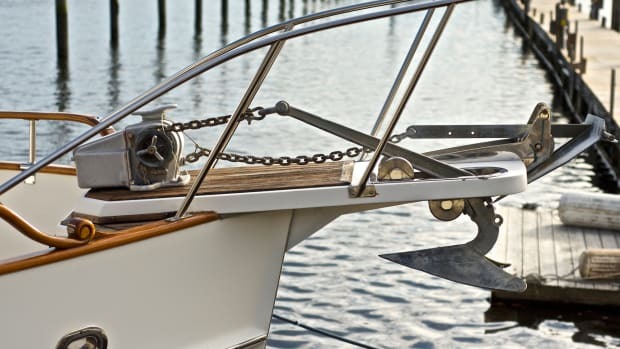 There’s at least one on every inboard-powered vessel, and two if you count those used on most rudders. The traditional design, the type that relies on rings of waxed flax packing material, has been around for hundreds of years, having first seen widespread use on the water pumps attached to Dutch windmills. As simple and rugged as they are, however, they do require routine inspection and periodic maintenance. A stuffing box failure is nearly always a catastrophic event and therefore worth avoiding at nearly any cost. The hole through which the propeller or rudder shaft passes, the shaft log, is necessarily large, often three inches or more in diameter, making it a potentially large avenue for water flow in the event of such a failure. Although some stuffing boxes are rigidly mounted to the shaft log, most ‘float’ via a length of flexible hose, which is retained to the log at one end and stuffing box at the other end using conventional hose clamps, typically two at each end. The gap between the propeller shaft and the inside of the shaft log is often substantial. This allows for leeway when adjusting shaft and engine alignment. However, as mentioned previously, it can also allow a substantial amount of water to flow should the hose tear or separate from the log or stuffing box. The resulting torrent will almost certainly be one with which few bilge pumps could keep up. Many stuffing boxes rely on yet another smaller but no less important hose—the one through which water is pumped from the engine, affording the stuffing box’s packing material and cutless bearings improved lubrication and cooling. Typically, this water is tapped from the engine’s raw water cooling system; either at the water pump itself or via a T fitting immediately before water is injected into the exhaust system. The good news is such failures are easily avoidable, and such prevention begins with regular inspection. Stuffing boxes should be reviewed on a regular basis, including a daily cursory inspection and a more thorough inspection, using a mirror to look at the bottom half of the hose and clamps, on at least a monthly basis. Cracked or otherwise irregular hose or corrosion on, or rust stains emanating from, hose clamps call for action. Hoses and clamps that show any of these signs of deterioration necessitate their replacement. Replacing clamps is straightforward and relatively easy. Replacement clamps should be made from all 316 alloy stainless steel, including the screw, and their bands should be solid rather than perforated (for more on clamp selection and use see Channels Vol. 1 and 2, Aug. ’11). For large-diameter, heavy-walled hose, conventional band clamps may have difficulty imparting the necessary compression. In that case T-bolt clamps may be used. However, if T-bolt clamps are used, avoid the variety that relies on a folded, spot welded design as these are susceptible to crevice corrosion. Instead, use clamps that are mechanically interlocked rather than folded and welded. Bronze stuffing boxes will nearly always develop a green patina, often referred to as verdigris; this is a completely natural and harmless phenomenon. Heavy verdigris, however, can make disassembly and adjustment difficult. Periodically spraying the stuffing box with a corrosion inhibitor will reduce accumulation of this material and make service easier. While it may look ordinary, the hose used with conventional stuffing boxes is, or should be, proprietary. Ordinary raw water or exhaust hose may utilize three or four plies, while proprietary stuffing box hose incorporates five plies. Because hose used in stuffing box applications lives an especially hard life, it’s submerged, vibrated, and routinely twisted in forward and reverse. The added heft of five plies is a clear value added. 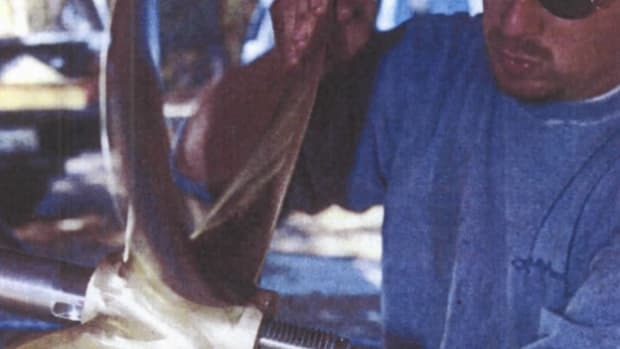 Replacement of the stuffing box hose is somewhat time consuming in that it requires separation of the propeller shaft from the transmission coupling. It is, therefore, a task that must be carried out while the vessel is hauled. Conventional wisdom dictates that stuffing box hoses should be preemptively replaced approximately every five years or sooner if warranted. Water injection hose must also be appropriately suited to the task. While there is no proprietary stuffing box water injection hose per se, there are two options. Type A marine fuel hose is extremely rugged, heavy-walled, and resistant to chafe. It’s routinely used for raw water injection applications and typically long-lived and reliable. Type B fuel hose is also rugged and reliable and may be used in this application, however, its wall thickness is less than Type A hose and as such it is less resistant to chafing, kinking, and crushing. Ideally, Type A hose should be used. Under no circumstances should ordinary, clear flexible PVC hose be used for this application, regardless of internal reinforcement. Clear PVC hose lacks the necessary chafe, kink, and crush resistance required for all raw water applications, and especially those that are used in critical and harsh applications such as this one. Repacking and adjusting a conventional stuffing box is a task that intimidates many, however, this shouldn’t be the case. With the right instruction and some practice it’s well within the reach of most handy do-it-yourselfers. Traditional waxed flax packing material is readily available in a variety of diameters. With few exceptions, these are specifically matched to the shaft diameter, a 2-inch shaft, for instance, utilizes three 3/8-inch packing while 1-1/2-inch shaft utilizes 1/4-inch packing. Therefore, if you know your shaft diameter, obtaining the correct size packing is straightforward. Modern variations on the traditional waxed flax packing include Teflon and Gore-Tex. While these packing variants tend to be more slippery and longer lasting than flax, they can in some cases work too well. That is, they may not allow enough water to pass, especially if improperly adjusted, which leads to stuffing box overheating and excessive shaft wear. Therefore, high tech packing materials should be used with caution and monitored closely after the initial installation. In some cases, a hybrid arrangement of conventional and high-tech packing materials may provide the best results. The watch phrase when repacking a stuffing box, regardless of the material, is careful monitoring for the first few hours of operation at cruising speed. Ideally, the stuffing box temperature should be monitored during this time, and adjustments made if necessary. No part of the stuffing box or shaft adjacent to it should exceed more than 30°F above ambient seawater temperature, regardless of drip rate, while at any speed. In fact, with access to an infrared pyrometer, drip rates are much less important than they once were. Check your stuffing box regularly and provide it with the care it needs. Doing so will yield the dividends in both longevity and reliability.